Heading cuts are made just above the nodes. The buds directly below a heading cut generally produce new shoots. To encourage shoots to grow outward and produce a spreading shrub, cut above a bud facing outward. Buds that face inward may yield branches that are crowded and impair the anticipated growth form. Leave enough of a stub below the cut to keep the bud from drying out. 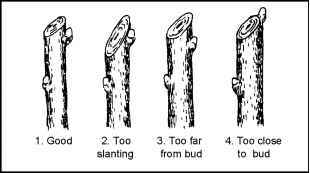 Cut plants that have opposite bud arrangement, 1/4 inch above the buds at a right angle to the stem. Usually, both buds will grow, producing two equal new shoots growing in opposite directions. This is often undesirable. Rub or cut off the unwanted bud, probably the one facing inward. Maple, dogwoods and ash are common landscape trees that have opposite bud arrangement. It is difficult to maintain a center leader in these trees without diligent pruning. 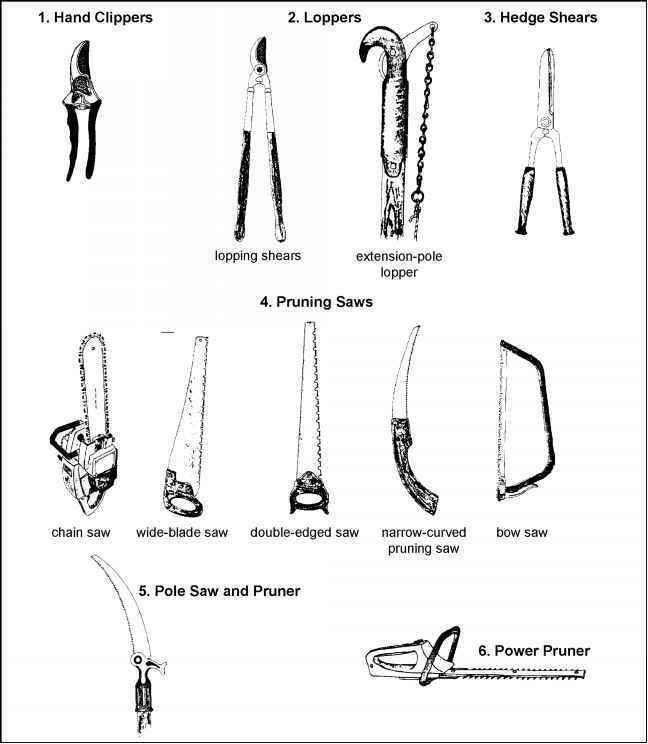 Pruning can cause plants to react in different ways, due to the wounding of the plant. Knowing how a plant will respond is necessary to achieve the desired landscape effect. For instance, a deciduous shrub produces new growth at the terminal buds. 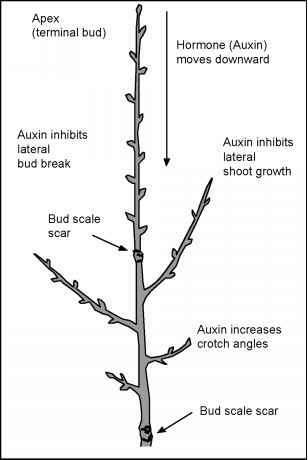 Terminal buds produce a growth regulator called auxin that controls the development and growth of lateral or side buds (buds lower on the branch). This is called apical dominance. When the terminal bud is removed, the lateral buds are stimulated to grow, due to the lack of auxin. These buds are found at nodes, and each node will have one or two (rarely three) buds. Apical dominance is strongest in shoots that are vertical or upright. For instance, limbs growing upright have the most shoot growth at the terminal bud. 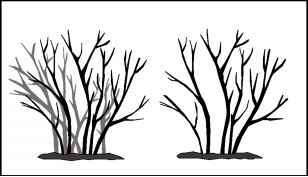 Limbs or shoots that are wide-angled or horizontal have less vigor at the terminal. More growth occurs from lateral buds along the limb. On some plants, apical domi nance is totally lost on horizontal branches. Lateral buds on the upper side of the branch can develop vigorous upright shoots called water sprouts. 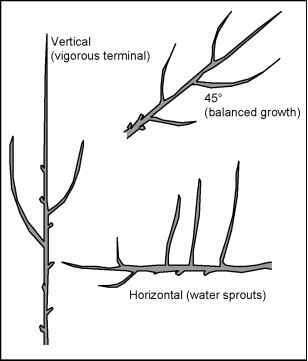 Water sprouts can exhibit excessive apical dominance, which limits the natural growth of the plant.